Lying is usually viewed as wrong and appropriately so. To call someone a liar is not a small undertaking and to do so falsely causes major damage and is a sin. However it is not enough that someone disagrees with you to think they are lying; opponents can be wrong without being dishonest. We must not confuse a person's opinion of reality with distortion of what they know. Ultimate truth is what conforms to reality. Falsehood is what does not. But to pass off what one thinks is reality when it is not reality is not the same as distorting what one knows to be the case. Scenario 1 is truth telling, scenario 2 is lying, but what of scenarios 3 and 4? The problem is we have disagreements over what reality is. Differing opinions may be related to arguing at cross purposes or real disagreement. If the opinions are incompatible it may be that both persons are wrong, but if one of them is correct, logically the other must be incorrect. The person arguing for the incorrect position corresponds to scenario 3. To call that person a liar is, in fact, not correct. The difficulty is the argument is over which position is correct. Calling the other person a liar at least implies that one is certain they are correct (they may be, but this misses the point there is disagreement); it may also imply the other person is misrepresenting what they know to be true, whereas they may actually believe their incorrect position. So to prove someone a liar one needs to demonstrate the person is aware of some fact that contradicts their position and they were hiding this knowledge to suit their purposes. This is important. Calling someone a liar seems to be yet another common way of refusing to debate the issues. It is really a form of equivocation: someone claims that not being in agreement with the facts (scenario 3) is as an adequate definition of liar, but in tarring someone as a liar suggests they are in the position of misrepresenting what they know to be true (scenario 2), and it is this (the implied scenario not the actual one) which is seen as a moral failure. Whether lying is ever acceptable is another topic. And what of scenario 4, being in the position of telling what you think is a lie but in actuality corresponds to reality. Well that still makes you a liar, however if people act on your lies it is likely to result in less damage to society than scenario 2 (and perhaps scenario 3). God: You can't mess with free will. God: Yes you can, that's the beauty of it! It is interesting what Merchant didn't critique. The main contributor to the greenhouse effect is water vapour and we really don't have a handle on that. This means I am less interested in the models than the global warming proponents are. T.J. Nelson has some comments on the validity of modelling assumptions, including on the thermal runaway effect. A lot of what Merchant critiques the program for his own camp has done in ways far more dramatic and sinister. I don't blame him for this personally, but it would be good to acknowledge that the pro-global warming camp has much shonky behaviour and poor science presentation to repent of. Sort of removing the log from your own eye. I find it interesting that someone whose presentation includes revealing fallacies, at times doesn't understand them fully and at other times engages in them. I think that some of Merchant's comments are not so much showing up the errors of the program, rather he is judging it from his viewpoint: that anthropomorphic global warming is true; and therefore he slams them for dishonesty when it is merely the difference of opinion over the competing theories. Your opponent is dishonest when he misrepresents data, he is not dishonest because he believes an alternative theory—even if he is incorrect! It would be beneficial to the debate if the Great Global Warming Swindle had more exposure. If they had the motivation it would be useful for the producers to review Merchant's critiques and modify the program so that any of his valid ones are addressed and areas of possible misinterpretation are discussed with more clarity. While true lack of context is a problem as is appeal to authority, mostly the program doesn't do this. In terms of appeal to authority, the program does have scientists on it but it goes on to explain why the things it is claiming to be true are true. Appeal to authority is, "Professor X said this so it is true." The program explained what and why and how. Interviewing scientists is not appeal to authority unless it leaves it at that, which it doesn't. As opposed to the global warming proponents who say things like, "All scientists now agree so we don't need to discuss it" which is a form of this fallacy. Context means everything. And a quote out of context can have a completely different meaning. There have been some concerns raised by Carl Wunsch that what he said was used out of context. But Merchant has to give examples. Blaming lack of context is a easy way to disparage your opponent. I disregard his comment unless he gives examples so I can assess whether the context was adequately addressed. People who are quoted in a medium that opposes their overall viewpoint don't like this; but if what they think on a particular issue is used in context, that is, not out of context, they are being used as a hostile witness—this is acceptable. I do think it is gentlemanly when quoting your opponent to make it clear what their belief is. Creationists quote evolutionists to show up evolution, but they don't (or shouldn't) imply the person is a creationist. But then why would you? an argument appears very persuasive when believed by your opponents! The research funding for "global warming" has increased greatly. Scientists want to perpetuate a myth to maintain their funding. It is true that the evidence needs to be evaluated on its own merits (though I don't see a lack of claims about oil companies funding anti-global warming research). It is also true that money is a motivation. And it can have subtle (and not so subtle) effects on people. But what he doesn't mention is how the type of funding can affect research. There is a difference between funding directed at what affects the weather/ climate and funding that is directed to look at man's contribution to climate and funding that is directed at human caused global warming. If your funding is to find an answer then people (being fallen) have at least some motivation to find what they have been asked to. The pressures can be significant, funding can be non-existent elsewhere, and scientific fraud (in many areas) has been well documented. Not to mention the desire to make a name for oneself. So money can be a motivation, but both sides must evaluate the data. It is too easy to dismiss your opponents by calling into question their motivation, it is more difficult to debate the science. Do not let an opponents lack of integrity be a cause for yours. Merchant mocked a sun specialist's prediction about December and January being cold (implying this is simple to do given that the period was during winter). But, from memory, he was predicting a colder winder whereas the majority were predicting a warmer winter. Slides 20 thru 24 show graphs of temperature versus time. This is compared with normalized "solar activity" from data Merchant has obtained. The time scale is from 1860 to 2000 but with data only to 1980 as per the Great Global Warming Swindle. Slide 20 shows the raw annual data. Slide 21 shows data smoothed over 11 years. Slide 22 shifts the early part of the graph leftward (earlier). Slide 23 shows the data distorted by filling in the gap in slide 22. Slide 24 is the smoothed data of slide 21 but thru to 2000. Smoothing is a valid procedure so long it doesn't show something contradictory from the unsmoothed data. If one wishes to show trends then some types of data will need to be smoothed. All data has some smoothing (though in a slightly different way). If you present monthly temperatures they are averaged daily temperatures (a smoothing phenomenon). The smoothing done here is more than using a different time division (day versus month), it is taking in to account data either side so 11 year smoothing is taking the year plus the five years either side and averaged while presenting the data in yearly divisions. This is a serious charge. If they have manipulated their data, that is unacceptable and it would be helpful for the presenters to be clearer on the source data. However it seems that Merchant has misunderstood the source data as he now acknowledges. Not showing data further than 1980 is not honest if there is a difference. The presenters should have shown it. But this doesn't disprove their theory; Merchant came up with an auxiliary theory (particulate matter) for the unexpected cooling, the solar advocates may have an auxiliary theory. It is interesting he condemns the solar data for misrepresentation, yet how long was the hockey stick graph used? and how many people did it influence? and how much is it still used? despite its validity now being questioned by proponents and opponents. Further, the sun hypothesis is just another theory to explain warming. It untrue it does not affect the critiques of global warming. Now scientists are suggesting global warming on Mars; this gives the sun hypothesis increased credibility if one subscribes to Ockham's razor. What potential effect could man be having on global temperatures? The mean global temperature is ~14 °C which is 287 K. The increase in the earth's temperature due to the greenhouse effect is thought to be about 33 °C (= 33 K). 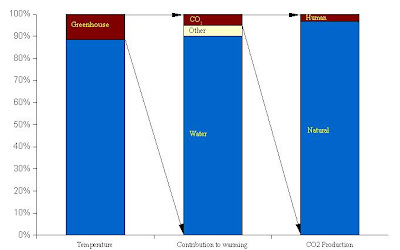 The contribution to the greenhouse effect by water including water vapour and clouds is probably 80-90%; CO2 5-10%; and other gases 5-10%. The annual production of CO2 from all sources is estimated at 200 Gtonnes. Man's input is about 7 Gtonnes. I have graphed this to show visually man's role. What to make of the climate models? Climate models require many uncertain parameters, that can be "tweaked"
Here Merchant seeks to justify the models. Fair enough. But all the program's criticisms of models are valid. I think it is interesting that there is no adequate validation of the models. They are tweaked to make them fit the data. I don't object to this. But I don't see the tweaking as proof, I see subsequent data fitting the models (without further tweaking) as the beginnings of proof. So one is limited in being able to prove historical science because of the nature of it being non-repeatable. This is not a failing, rather an intrinsic limitation of it. Modelling historical climate (even as recently as the near present) falls mostly under historical science. That means that in order for the models to be accepted they must be validated. One can validate by working with some of the data and checking it with the rest of the data. But if all the data is used, or the models are adjusted with subsequent data then the theory remains unvalidated. Observational data is validated but differently; and it is gives more definitive results as anyone can potentially repeat the experiment over. Note Merchant does not mention water vapour in the variables of the models. This may be an oversight in the presentation but water is very important—the most important. He says that modellers try to have realistic assumptions. Yes, but they are assumptions. And if you believe in global warming and your models predict this you are likely to think your assumptions are good. He dismisses radiation by saying this can be accounted by a few assumptions. But that is the debate is it not? I could say the same about CO2 . In fact CO2 should be easier as one just allows for a slow increase, whereas radiation is less predictable. How about minimising assumptions, stating them clearly, then validating your model. He showed earlier models on slides 8 thru 10. These had actual temperature and predicted temperature versus time for 1850 to 2000. The first was natural climate forcing: solar and volcanic; the second was anthropogenic forcing : green house gas and sulphate aerosol; the third was both natural and anthropogenic factors. These models are just too accurate (for something as difficult as climate). Clearly the parameters have been tweaked to get this. This is okay, but it is not proof. It is a model, follow the model for some years and see if it continues to be true. While you are waiting for this, you have not proven anything, nor can you expect people to change behaviour based on your model. (Never mind that the idea that one can be so certain of the distinction of natural CO2 versus man-made CO2 is just too absurd). And the models have not predicted accurately. There is now a lot of talk about Arctic ice-melting. Could this be because the temperatures have not been as high as predicted for the last few years so they lessen the discussion on the temperature and start discussing some effect they claim is related to it? Merchant states that both temperature and CO2 are driven by orbit changes. But this statement is a tacit agreement that Gore's proof is invalid. The program's point does not prove that CO2 can't drive temperature and I'm not sure this is what the presenters are saying. What they are saying is that Gore's chief proof is not true because the temperature changes precede the CO2 changes and do not follow it. One can go with the program or with the Merchant but either way, both show Gore's presentation to be a logically invalid argument. He states this doesn't necessarily prove CO2 is not important now (I agree). But if your major proof is shown to be invalid you can no longer rely on it. Further, in terms of logic disproving A does not prove B (unless B equals not A), but it may support it. His option C is just a story. Stories can be true or untrue, but coming up with a plausible explanation allows for a scenario, it does not prove it. Frankly, causes of repeat ice-ages just are not understood. I think there is evidence for a single ice-age which, in some ways, we are still coming out of. Line 3 does not follow, just because we are producing CO2 does not mean we are changing the amounts in the atmosphere significantly. And the argument that CO2 is forcing the change in T rather than responding to the change in CO2 is an assumption. Changes in gases in the atmosphere are considered to follow or force temperature. Following temperature means that the amounts in the atmosphere are a reflection of the temperature of the atmosphere. Forcing temperature means that the gases are changing the temperature of the atmosphere. A gas can potentially follow, force or do both. Asserting which is based on theory as much (or more so than) as data. Water vapour and clouds have a far greater effect on greenhouse effect but the proponents of anthropomorphic global warming suggest that ongoing changes of water follow rather than force. This allows them to effectively ignore a potentially larger cause. Well maybe someone should tell Al Gore this! Does small equal unimportant or small? No, small equals less important than large. To improve the analogy, if I wiped cyanide on someone's clothes and someone else gave them a salad with a cup of cyanide in it, it is unlikely my contribution significantly lead to his death, as alone it may have made him slightly sick. Another example would be someone poisoning themselves with carbon monoxide from exhaust fumes while smoking cigarettes; the amount of CO gained while smoking is not enough to kill anyone but the amount in car exhaust is. For someone who, in his presentation, has concentrated on logical fallacies, this is unacceptable misrepresentation. Opponents of the global warming agenda acknowledge that atmospheric CO2 contributes to the greenhouse effect. The program is not saying that the amount of human produced CO2 is intrinsically small so it unimportant, they are saying that the human contribution is a small part of a small part. More importantly I would add that our contribution is smaller than the natural variation! If what we are putting into the atmosphere is less than the natural variation from year to year how can one say that the man-made is to blame and not the natural. The CO2 produced by us or "naturally" is the same chemical. Why can't natural sinks take up human produced CO2? It is not like they can tell the difference. The program does not deny that CO2 levels are rising (as Merchant implies), just the cause. He makes the mistake that he knows the cause of the increase, but that is what the debate is about: correlation does not imply causation. Is the warming happening at the wrong time? Sorry, but the raw data still says that the warming happened in the wrong time in the 20th century compared to prediction. Now Merchant can come up with accessory hypotheses like aerosols and that is completely permissible. But the accessory hypothesis is used to salvage the theory. All he has proven is that his favoured theory has not been totally discredited because there are further sub-theories. But a theory that is able to be salvaged is not automatically the correct theory, it just may be. There is a difference between a theory being able to explain data and the data being proof for a theory. For data to be proof there needs to be a prediction that is confirmed by subsequent investigation. I will talk more about this in the modelling discussion. It is interesting that the global warming fanatics don't ask us to start burning fossil fuel in a dirty manner again (to increase aerosols) until alternative fuel sources become adequate! (Actually this has been proposed by one man). But if Merchant really believes it is aerosols that lead to cooling maybe he should be an advocate for this. He is correct about the delays in the change in global temperature but we certainly wouldn't expect a decrease in temperature as a result of CO2 if the global warming theory is true.